Since Jesse bought The Well-Built Triathlete by Purple Patch coach and former professional triathlete Matt Dixon, he’s been raving about Matt’s techniques and what Matt calls the pillars of performance. Matt, formerly known as the “recovery coach,” endorses key workouts during the week to improve fitness (high-quality workouts rather than mindless volume) and recovery workouts and rest days to ensure consistency. One of the pieces from the book that I find most fitting to myself is how Matt describes chronically fatigued athletes: tired all day and alert at night. That description, along with the other warning signs he describes, hit a little too close to home. My own struggles with sleep and fatigue, including jumping into marathon training after training for an Olympic triathlon, have made me re-think my own workout regimen. 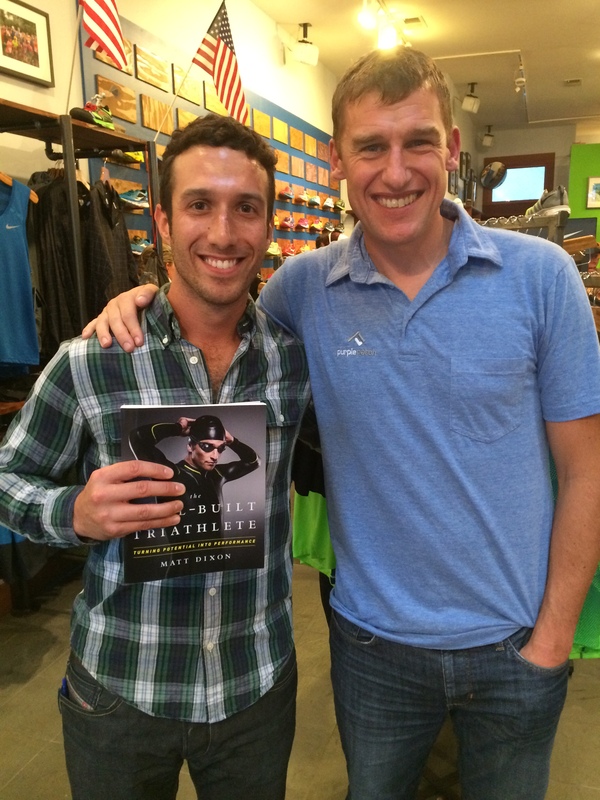 Last night, Jesse and I went to A Runner’s Mind, a boutique running store in Laurel Heights, to hear Matt Dixon speak and answer questions and sign books. He was accompanied by professional triathletes Meredith Kessler and Laura Siddal. Meredith and Laura spoke about their respective journeys, with Meredith coming to Matt as an 11.5 hour Ironman and transforming into a world-class champion. Laura recently made the switch from amateur to professional and said that she’s loved the process and support from Purple Patch. Matt Dixon speaking to the audience. The talk was inspiring and left me wanting to fulfill my goal of completing a half Ironman. Matt wished athletes racing Vineman this weekend the best of luck and mentioned how the course is one of the best. I’m determined to put this race back on my schedule and plan on scoping out the course on Sunday. While I won’t be toeing the line this weekend, I’ll be enjoying Guerneville, running an “easy” 12 miles, and watching Jesse crush Vineman (while perhaps enjoying a glass of two of wine country’s finest). Have a great weekend! Interesting book! I’m not a triathlete, but I may have to check this out…getting sick so many times while training for the upcoming marathon is a red flag that my training is wearing me down! So true! There’s so much running-related information that it’s interesting for the non-triathlete too! Also just wanted to let you know that your Gravatar does not link back to your blog. You may want to edit it so when you ‘like’ someone’s post and they click on your photo they can find your blog. Just a thought and feel free to delete my comment. Thanks Sue! I think I see what you’re talking about – I made a change on Gravatar and hopefully it works as expected now. Thanks for pointing that out! Sounds like a great talk!! 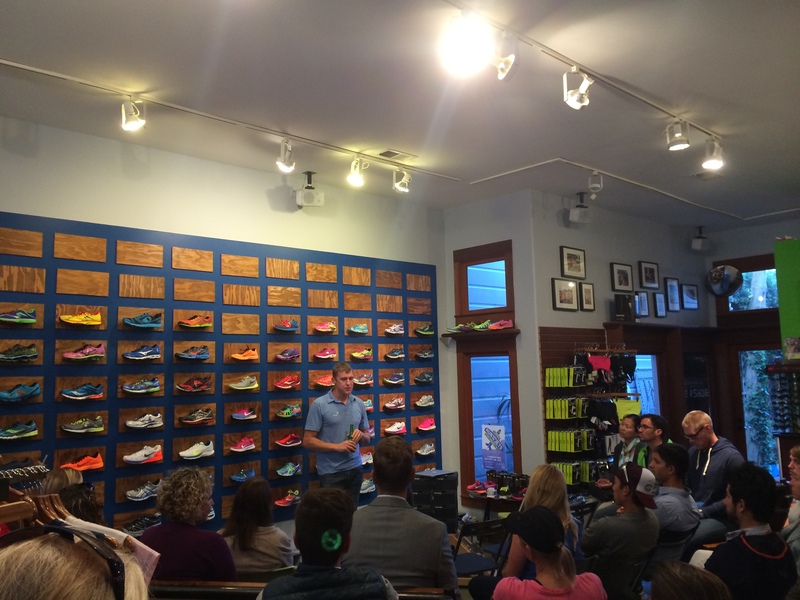 I love hearing pro triathletes talk! I have never heard of that book but sounds interesting. I will have to check it out!! I would love to do Vineman and it is always talked about when we are deciding what races to do but I have a hard time with the heat. I love being in the sun but not while I am trying to race!! Agreed I think Jesse is going to kill it this weekend! Have fun spectating!! I have got to get that book. I too could sleep all day and stay up all night. UGh, so not a good feeling.